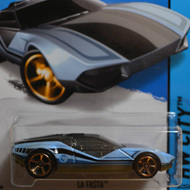 77/250 is part of the HW City series and the 2014 Treasure Hunt set. 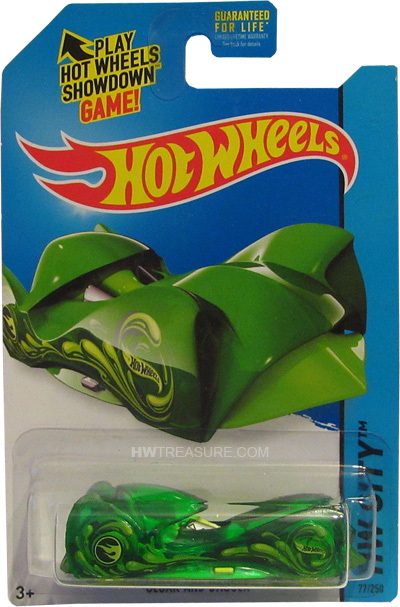 The transparent green car sports black, green & yellow graphics of flowing droplets, the low production symbol, and the Hot Wheels logo. It has a chrome interior, Open-Hole 5-spoke wheels, and a chrome plastic Malaysia base. The Cloak And Dagger made its debut in the 2007 New Models series. It is a unique design that often features a transparent or translucent body. The body can be removed to reveal the inner workings of the car.